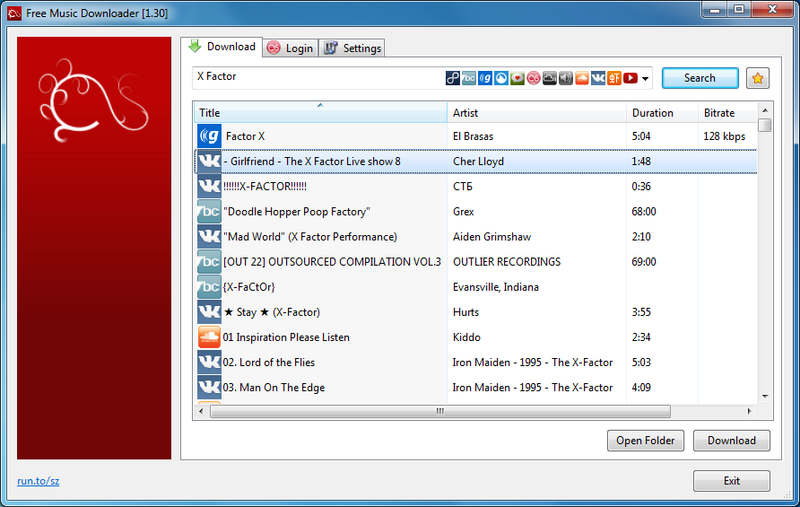 Free Music Downloader is a simple tool for locating and downloading MP3 files. The program comes in the form of a single executable (no installation required, no account to set up), so it's very convenient to use. Just unzip it and you're ready to go. And once launched, enter an artist or song title, click Search, and the program will check a variety of sources for matches: www.last.fm, vkontakte.ru, goear.com, youtube.com, GrooveShark.com, SoundCloud.com, mixcloud.com, BandCamp.com, Hypem.com, Xiami.com, ProstoPleer.com and 8Tracks.com. Free Music Downloader isn't Google, and the search isn't particularly smart. If you don't enter precisely what you need we found Free Music Downloader would return lots of irrelevant results. For the most part, though, the program does a good job of finding whatever you need, and grabbing copies is as easy as selecting the relevant matches and clicking the Download button. And if you plan to download a lot (and you've a fast internet connection), then it's worth noting that Free Music Downloader can download up to 10 files simultaneously. Click Settings and set "Simultaneous Downloads" to whatever works for you.